On December 27, 2007, one of Pakistan's most influential politicians, Benazir Bhutto, was killed at a political rally. Renowned Pakistani journalist Hasan Mujtaba talks to DW about Bhutto's politics and her murder. It's been ten years since Pakistan's former prime minister and one of the country's most charismatic politicians, Benazir Bhutto, was assassinated in the city of Rawalpindi during an election rally. Bhutto had designated her son Bilawal Bhutto Zardari as her political heir in her will, but political analysts say Bilawal has neither the leadership qualities nor the support of the masses that his mother or his grandfather, Zulfikar Ali Bhutto, enjoyed. And yet the 29-year-old scion is trying his best to revive their Pakistan People's Party (PPP). Since 2007, when Bhutto was shot dead by an unknown assailant, her widower Asif Ali Zardari has been leading the party alongside his son. After Bhutto's death, the PPP won the general election in 2008, allowing Zardari to become president of the Islamic country, but in the 2013 parliamentary vote the party was almost wiped off the political landscape, and its presence was reduced to its Bhutto stronghold in Sindh province. Zardari's administration was marked by massive corruption scandals, incompetent governance, nepotism and the inability to rein in home-grown Islamist militants. A United Nations commission, set up to investigate Bhutto's murder at the request of the PPP's government, revealed in its detailed 2010 report that the security arrangements for Bhutto were seriously inadequate, and that some military agencies had tried to hinder the initial investigations. Former military ruler Pervez Musharraf has also been implicated in the Bhutto murder case. He denies any involvement and blames the Taliban. The Islamist group says it didn't kill Bhutto. The debate in Pakistani politics has now moved far beyond Bhutto's assassination. Other big players have emerged on the political scene, such as cricketer-turned-politician Imran Khan. The reason his Pakistan Tehreek-e-Insaf (PTI) party resonates well with a large section of the Pakistani middle class is its emphasis on governance issues - particularly corruption and political accountability. Still, the figure of Benazir Bhutto continues to inspire many liberal activists and intellectuals in Pakistan, who believe that she sacrificed her life for the consolidation and supremacy of democracy. In an interview with DW, Hasan Mujtaba, a US-based Pakistani journalist who has extensively covered the Bhuttos and the PPP, says Benazir Bhutto's politics was full of paradoxes and that her party has lost popularity under her widower Zardari's leadership. Can Bilawal Bhutto Zardari revitalize his mother's party? DW: Ten years since the assassination of Benazir Bhutto, why has her murder investigation remained inconclusive? Hasan Mujtaba: It was a choreographed assassination with an "unknown" director and many actors. Pakistanis are familiar with such high-profile political murders. The place where Benazir Bhutto was killed, the Liaquat Park in Rawalpindi, where the Pakistani army's headquarters are based, is where Pakistan's first PM Liaquat Ali Khan was shot dead in 1951 in pretty much the same manner. Those who murdered Khan were never brought to justice. Bhutto's Pakistan People's Party came to power after her assassination, with her husband Asif Ali Zardari becoming president. Zardari showed little or half-hearted interest in resolving the case. The current PPP leader says that he "knows the killers" but he is reluctant to name them for unknown reasons. It is common knowledge among Bhutto's close friends that her relationship with Zardari had deteriorated during her last years of self-imposed UAE exile. The person who benefited most from Bhutto's death is Zardari. It was he who didn't allow former military dictator Pervez Musharraf's government to conduct an autopsy of her body. The postmortem could have been helpful in finding clues about her murder. In an interview to biographer Shyam Bhatia, Bhutto had identified threats from a number of actors, including the Pakistani military. How do you analyze the PPP's performance under Zardari's leadership? Her widower Zardari is like a man who has won a multimillion-dollar lottery. We must not forget that during exile, Bhutto had pretty much politically sidelined Zardari. As co-chairman of the PPP, Zardari has proven to be a disaster for the party. But as president, he achieved some milestones in Pakistani politics. He introduced the 18th amendment in the country's constitution to decentralize the federal government's powers to provinces. Zardari also took a reconciliatory approach toward his political opponents. The downside is that he systematically got rid of Bhutto's friends and aides from the PPP. Do you see Bilawal Bhutto Zardari as a politician who could revitalize the PPP? Bilawal is intelligent but his political career has been scripted by his father and members of his team. He could revive his mother's party if he breaks free from his father's influence and takes charge of the PPP. Benazir is widely viewed as a democratic icon. You, however, are critical of her politics in your writings. Why? Bhutto was undoubtedly a towering political figure, who resisted military dictators. But during her two-time stint as prime minister, she was highly undemocratic and compromised on democratic principles to stay in power. She made compromises with the military and put political opponents in jails. She also banned newspapers and targeted activists of the Muttahida Qaumi Movement (MQM) in the southern city of Karachi. Why do many Pakistani liberals still pin hopes on the PPP to take the country out of a myriad of political crises? Is it due to their "political romance" with the Bhuttos or something else? Those against the supremacy of the military in Pakistan have supported the PPP for decades. For many of them, the party still offers hope. The PPP is a federalist party that has followers in all four provinces of the country. What are the PPP's chances of securing victory in the 2018 general elections? The party that was born in Lahore 50 years ago could only secure 1,500 votes in recent Lahore by-election. It was not even the third largest party in the polls. I'm afraid that is the future of the PPP. However, it is likely to perform better in its political stronghold, Sindh. Hasan Mujtaba is a New York-based award-winning Pakistani journalist, writer and poet. He has worked for the Karachi-based Newsline magazine and the BBC Urdu service. He writes columns for the Urdu-language Jang newspaper and has extensively covered the Bhuttos and the PPP as a journalist. Does Imran Khan have a future in Pakistani politics? Pakistan is set to hold general elections this year which will be crucial for its democratic future. 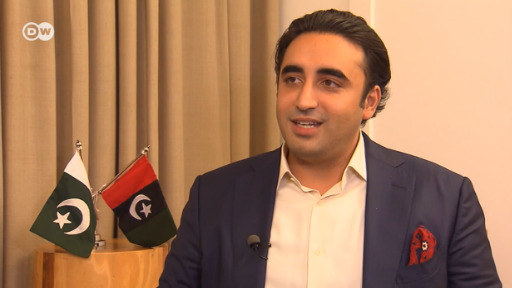 DW spoke to Bilawal Bhutto Zardari, Pakistan People's Party (PPP) chairman, about the key problems facing the nation.